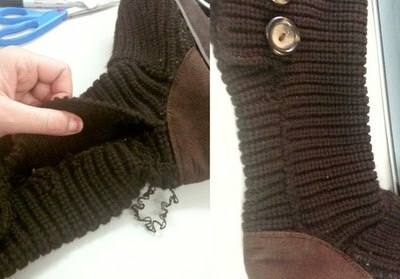 So the other day at work, a coworker asked me if she could bring in one of her sweater boots and if I could fix it. It had come apart at the seams... literally. So I pulled out the original thread that was holding the knitted sides together and then used that to go in the knitting loops that were about to come undone and wove them back together again. Then I took some more new matching thread and then used a sort of darning technique to finish off the stitching. I have to say.... This one looks even better than it did new. I guess I am the resident seamstress at work, which I don't mind at all because I obviously like it better than doing actual work.